Providing you with essential skills in understanding disability, organisational management and transformation. 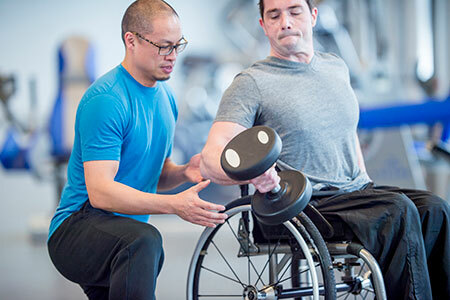 Are you currently working in any of the following areas, or looking to transition into these fields: disability support, health, human services, or rehabilitation? helping you to identify how to transform your business and people management practices within the specific setting of a disability service organisation. The program is designed to give you the skills to help your organisation to transition into the new era of service delivery, whether that be in the government, private or community services sector. Prior qualifications are not necessary. Two courses are available to students wishing to study disability services and management. Students will study clinical and neurobiological issues in the provision of disability services and management, and NDIS business management. They will also gain hands-on experience in the disability field through completion of a work-based unit of study. Teaching staff for this multi-disciplinary program are drawn from the School of Science and Technology, and the UNE Business School. Both courses may be completed online on a part-time basis, allowing students to balance study with work and other commitments. Entry pathways into these programs are available for individuals holding a Bachelor’s degree, Diploma or Advanced Diploma, or for individuals with relevant work experience. Prior qualifications are not necessary. Students completing the Graduate Diploma in Disability will complete four units as per requirements for the Graduate Certificate. They may then choose to specialise in a biomedical stream, to gain greater understanding of the biology of disability, or a management stream, to enhance skills in business management. Students may also elect to combine units from across both streams. Or other relevant units offered by the UNE Business School. The implementation of the National Disability Insurance Scheme (NDIS) has created a demand for employees with specialist education and training in the disability and human services sector. For general and administrative enquiries, AskUNE.